Millions of our family and friends are in immediate danger—some are in a database being delivered to Donald Trump. Check on your people, and be ready to stand with them. 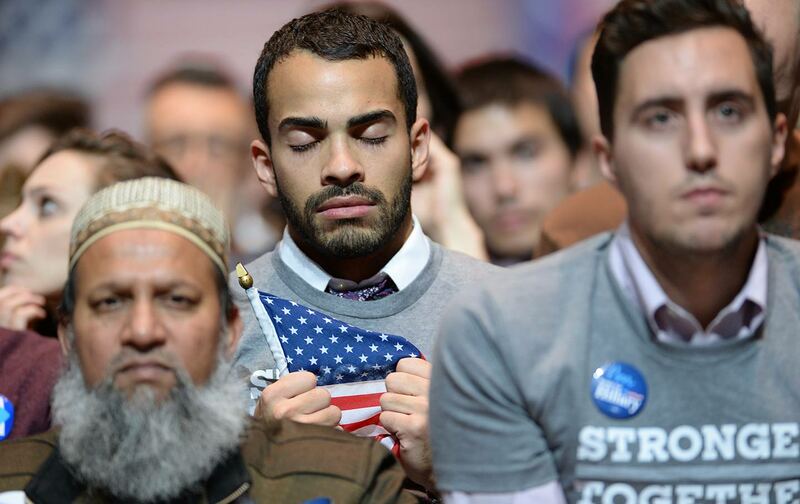 For immigrants, for Muslims, and for people of color in general, the results of this election feel like imminent death. Trump’s victory indicates that naked bigotry levied against us is capable of winning the toughest of elections. White folks who are concerned with matters of justice are asking themselves what can be done. They’re thinking about policies and states’ rights at a time when racist fascism looms over the White House. But the struggle now is also much more intimate than that: How are the most vulnerable people in your life doing at this very moment? It’s time you make a phone call to find out. Rodriguez was given the opportunity to prepare a statement before the Leader brothers were sentenced (they’ll each serve less time in prison than Trump will in office). In his statement, the former farmworker explained that he “actually became a permanent resident of this country years ago, although if I had been undocumented, I still would not have deserved to have been beaten in this way.” Forget that their victim wasn’t an undocumented resident; immigration status matters very little for people like the Leader brothers, whose eyes see in hues of hate. As election results began pouring in last night, so did a steady stream of anxiety-ridden phone calls and messages from immigrant friends and family members—ranging from people born here in the United States to others who arrived more recently. Most explained that they were calling out of some kind of desire to not be alone, and all explained a very tangible sense of fear. Young people with deferred-action states, who’ve enjoyed a reprieve from deportation under President Obama’s executive order, are worried: They’re in a database now. A database that Trump, who has promised to end the program as a first action, can easily use to come after people when he assumes the presidency in January. After all, nearly half of voters chose Trump, who’s consistently referred to Latinos in general (and to Mexicans in particular) as inferior objects. They voted for a man who, upon learning of the Leader brothers’ racist attack, told the press, “They love this country and they want this country to be great again. They are passionate.” For us, as Latinos and as immigrants, it’s natural to assume that half our neighbors may very well hate us. And even when we don’t assume that, it’s clear half our neighbors are comfortable voting for a man who does. The next four years will be infinitely difficult. To be cognizant of that should also mean we’re conscious of the hierarchies that already govern our experiences. Now, more than ever, all progressives, but particularly white progressives need to make unequivocal declarations of solidarity with vulnerable communities. As protests spread in response to Trump’s victory, demonstrators need to remember that the stakes are different for people of color, whose very bodies are targets. The stakes are especially different for undocumented immigrants—the people whom Trump turned into ridiculed objects of hate, and won an election by doing so. The least white folks who care about social justice can do right now is check in with immigrants they personally know to make sure we’re surviving. And to confirm we’re still alive. Editor’s note: An earlier version of this article incorrectly stated that half the electorate voted for Donald Trump. The piece has been updated to correct the error.